The Challenge: create a card that reflects a sentiment of "get well"
Sarah from "My Little Somethings" is our sponsor this week. She is giving away this great little prize package to one lucky U.S. participant. You can visit Sarah by clicking on the button below. inside reads "get better soon"
I used a stamp set from Unity Stamp Co. that I purchased last year and just never really had a reason to use it. It is called Heart Times. It has some really cute images and sentiments in it. But, I rarely do cutesy so, that may be another reason why I haven't used it. I also wanted to try the Lucky Limeade and Island Indigo color combination I have been seeing so many people use on their cards. I have to admit, I really like it. 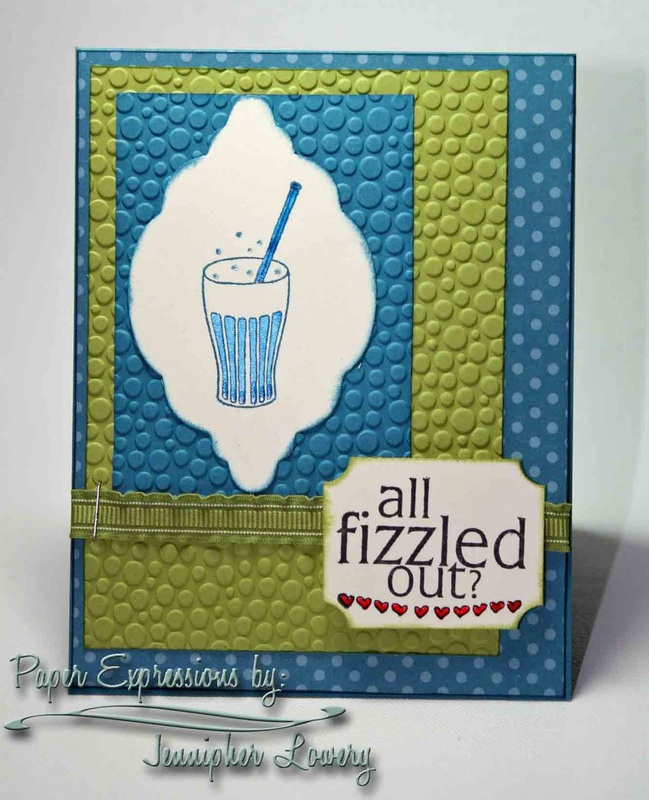 I used the tiny bubbles embossing folder from Cuttlebug as I thought that went nicely with the idea of fizzy bubbles from your soda. What do you think? On a slightly different note...I seem to be stuck at 99 followers! Can't seem to get over that hump to 100. If one person would be so kind to follow me so I could finally say I have 100 followers I would be truly grateful! As always, thanks for stopping by! Have a great week. categories: Dry Embossing Folder, Get Well, Perfect Sentiments, Sizzix Sizzlits, Stampin' Up, Unity Stamp Co.
What an amazing card Jennipher. I love the bubbly embossing, it goes so well with your image. And I love the little touch of red in your sentiment. I'm a new follower so now you got 100. Congrats!! This is strange, I was just going to click on "follow" and now it won't show on your sidebar. Sorry I can't be your 100th follower but I am sure you'll pass over that hump soon! As for your card- that's such a great color combo and the sentiment is so cute for a get well card! The image is perfect, of course, and those embossed dots are just the best with it! And wow- you even used a "cutsey" image ;-) Super fun card, Jenn. Great job on this week's challenge! Love the embossed "fizz"-it's perfect with your sentiment? Cute card!! This is a great card! Love the embossing with that fizzy soda and sentiment. Great color combo also with the Lucky Limeade. I checked to see if I was indeed a follower and already in there,so couldn't be your 100th. What a fabulous card! I love the embosing folders that you used! What a great image too! You will be at 100 followers and beyond in no time! Your work is great! What great texture! The colors are great too! Great project Jenn! LOVE all that fabulous embossing! Very cute card and sentiment - and wonderful colors! love the carbonated embossing! great sentiment too. You are AWESOME!! This is all kinds of "fizzy" wonderful!!! The idea to use that embossing folder goes right along with the fizzled sentiment.....brilliant!!! I think this is absolutely "fizzly" wonderful! Lovely card! I love the colors, texture & sentiment. Love all of those bubbles and your sentiment is perfect! Woo!Hoo! You have over 100 followers!! Your card is so adorable. I love that bubble embossing folder with that image. Just perfect. Great job. Your card is very cute. I think the bubble embossing folder is great with that image. Wow Jenn - this card just POPS! I totally love it! The image and sentiment are darling, and I especially love those colors with your embossing. It looks fabulous. Ya know, I think I have that embossing folder, and mine never looked that good at all! lol I'll have to try it again. Thanks for the inspiration! Oh this is adorable Jennipher!! 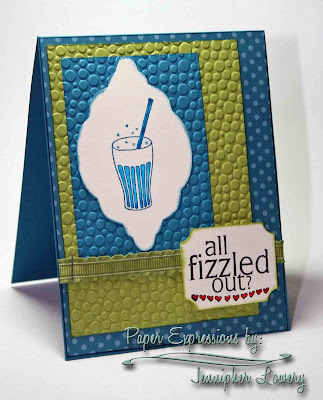 I love the colors and the tiny bubbles embossing folder is perfect for this image! Very cool card, love the embossing! Fab work as always. This is just adorable! I love that embossing folder with this image and sentiment, they are a perfect match! LOVE your card Jennipher! The colors you used are great together & your layout is awesome as always....TFS!!!! !